Great Falls Tavern. NPS photo. It may be unpleasant to be outside in the winter, but a lot of vital work happens in the park during the colder months, because every other living thing is suffering from the cold, too! The lack of vegetation can be a boon to maintenance staff working on structures, surveys, and more. There are many ways to volunteer — take a look at this list and choose the one that appeals to you! Our education staff stays busy year-round with school programs, both in and outside the park, and Rangers offer programs in the Park year-round also. We have exciting holiday events, recreational events like runs and walks, lectures, and so much more scheduled throughout the winter. Visit the Chesapeake and Ohio Canal National Historical Park‘s website for more information. This photo is used under a creative commons 2.0 Attribution License. Photo was taken by Bill Blevins along the Fairport Canal Path. What is better than traveling along the canal in the snow? Traveling with your best four-footed-friend on the canal! 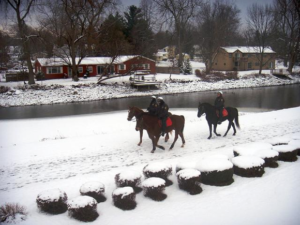 Horses are allowed on the towpath from Swains Lock (mile post 16.6) to the last lock in Cumberland, although they are not allowed in the Paw Paw Tunnel. If you do go riding in the snow, send us your pictures! Ice skating is a great winter pastime that is allowed everywhere in the Park except at Widewater, and where signs prohibit it. People have even been known to play hockey games at Cushwa Basin. A word of wisdom: the canal gets much deeper around locks, bridges, and similar structures, so please keep away from those areas to avoid breaking through the ice. This photo is used under a creative commons 2.0 Attribution License. Photo credit USFWS at Hillberg Lake. 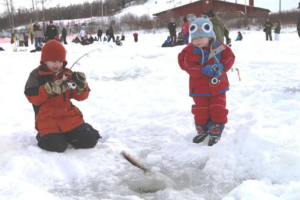 Believe it or not, you don’t have to go to Alaska to go ice fishing– you can do it right here! There are a few guidelines to keep you safe — and of course you need your fishing license. For instance, since we don’t have thick ice on the canal, you can’t cut a hole that’s more than 10 inches in circumference (because we’d prefer if there wasn’t an angler-sized hole in the ice, as well). While you’re at it, you could stay at a lockhouse right next to the canal for easy access (see #8 below) and head inside for fresh coffee when the fish aren’t biting! It may be cold, but the absence of leaves on the trees provides a great view of starry skies. All canal drive-in campsites are available for reservations through Recreation.gov, so be sure to reserve your camping spot ahead of time. Fires are allowed in designated fire rings year-round to help you stay warm. It’s a good idea to bring snug sleeping bags and some hot cocoa too! For more information on camping (and parking permits), go to the C&O Canal’s Camping page. Lockhouse 6, available for stays year-round. If you prefer a warm lockhouse to a chilly night at a campsite, nobody will blame you! The Canal Quarters program offers six lovingly rehabbed lockhouses you can stay in. Lockhouses 6, 10, and 49 all have heat to keep you cozy all night long. 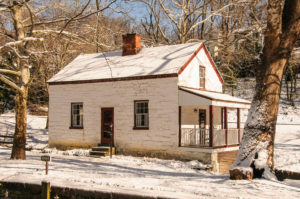 The lockhouses provide beds for 8 people, give you great access to the towpath, and provide a look at what life during winter would be like for lock tenders along the canal. You can learn more and book your stay on the Canal Quarters website. 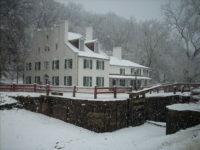 The C&O Canal Trust sponsors a monthly photo contest, and we are always looking for unique shots of the Park covered in the white stuff! Review our contest rules, grab your camera, capture the beauty of winter on (digital) film, and enter your best shots in the contest! When it’s just too cold to be outside, you can read a book about the Canal! There are many great resources available, which you can get from our gift shop, or from your local library! Curl up next to the fire with a blanket and hot cocoa and enjoy!